Sometimes you can't see what matters most until it's gone. ^Brenden McCarthy feels like he's lost everything. His fiancee. His independence. And his passion for life. All due to one tragic misstep while mountain climbing that cost him his sight. ^But he's about to gain the last thing he ever expected. ^A big-hearted black Labrador named Nelson who's given one last shot at being a Seeing Eye dog. ^Both are beyond hope and resigned to live alone. And both are about to experience a bond of friendship that develops when they least expect it. 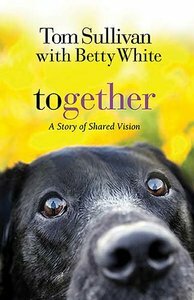 ^"Together" is a heartwarming story for anyone who's ever lost sight of what matters most in life . . . but has hope that there's more. - Publisher Brenden gave up hope. A playful black Lab gave it back.Brenden McCarthy pursued success with a singular focus, but then a mountain-climbing misstep turned tragic. He put his career in medicine, his family, even his pending marriage on hold. If he couldn't see, what good was he to anyone?A black Lab named Nelson, abandoned at Golden Gate Park as a puppy, was just trying to make it through each day. Until a seeing-eye dog trainer saw something special in the little pup's eyes.Both needed a friend they could count on . . . and a reason to carry on.Based in part on a true story, Together is a heart-warming story for anyone who's ever lost sight of what matters most. Brenden gave up hope. A playful black Lab gave it back.Brenden McCarthy pursued success with a singular focus, but then a mountain-climbing misstep turned tragic. He put his career in medicine, his family, even his pending marriage on hold. If he couldn't see, what good was he to anyone?A black Lab named Nelson, abandoned at Golden Gate Park as a puppy, was just trying to make it through each day. Until a seeing-eye dog trainer saw something special in the little pup's eyes.Both needed a friend they could count on . . . and a reason to carry on.Based in part on a true story, Together is a heart-warming story for anyone who's ever lost sight of what matters most.